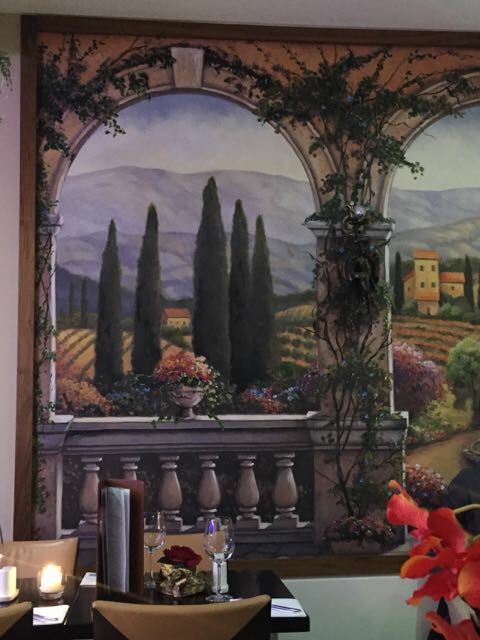 It’s been a while since I’ve dined under a cypress tree fresco, I think it was 1997 in fact when the world was going Changing Rooms mad, but we did so at Emporio Maria Italian Restaurant on Harborne High Street just a week or so ago. The décor is rather odd with cow hide chairs in the window, frescoes of Italian landscapes on the walls, a chinese paper screen, a Moorish lamp, and some draped fake ivy, but all in it has quite a charming effect. I was half expecting the fake ivy to be caked in dust as fake flowers are usually the go-to product for those who can’t be bothered with real ones, but the whole place was scrupulously clean – not a speck of dust in sight, it all feels very well cared for. That feeling extends to the service; polite and chatty waitresses are happy to explain the dishes or to recommend a wine to go with something. For starters we had the Calamari Fritti (£6.55), deep fried squid, dusted with egg and semolina flour, served with tartar sauce. It was a very large portion, the batter was crisp, and the squid soft and not at all chewy, and the dish was served with some lovely olives and some dressed leaves. Great dish all in I thought. 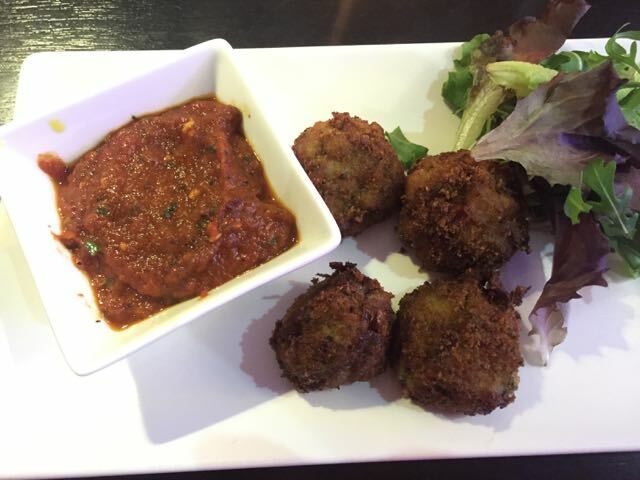 We also had the Polpeta di Melanzane (£5.95), aubergine balls with chillies, breadcrumbs, sundried tomatoes, and basil, served with spiced tomato dip. In contrast to the calamari I thought this dish was a little undersized and that the aubergine balls were bland, though the spicy tomato sauce was nice. It was also served with undressed leaves, which is a pet hate of mine. 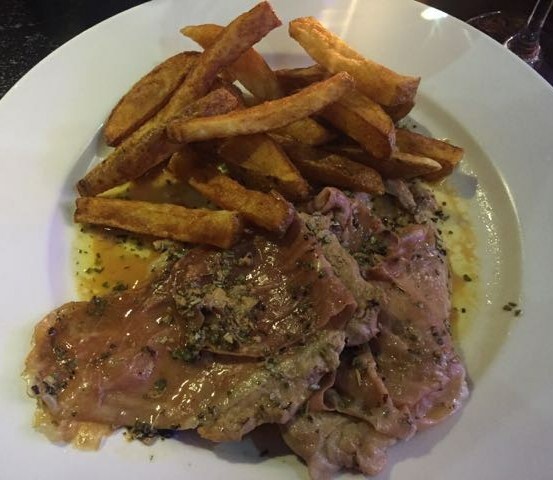 For mains I had Vitello Saltibocca (£15.50), veal escalopes served in a marsala wine, and sage sauce topped with Parma ham. I loved this dish, it took me back to being in a Tuscan farm house. Sage isn’t en vogue at the moment but it’s one of my favourite herbs, and it suited the veal perfectly. The veal wasn’t quite trimmed enough for me and the fat on it was not edible, much too chewy. 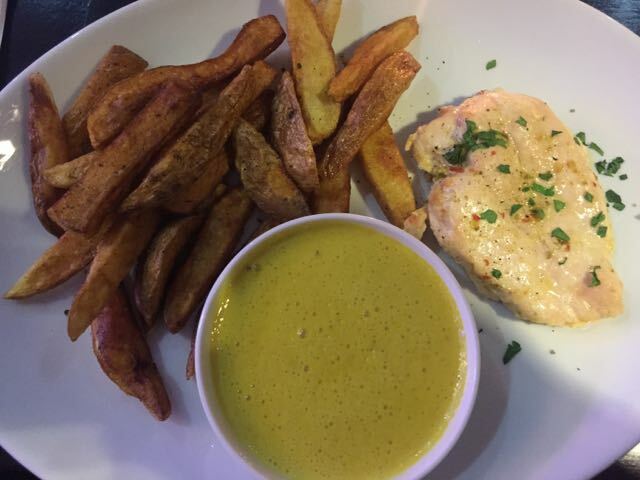 We also had the Petto di Pollo al Miele (£11.95), breast of chicken, in a honey mustard cream sauce. The chicken was moist, the sauce rich, and the chips crispy, pretty much as I would have expected. We were a bit surprised that the chicken was served on the side of the sauce, the dish wasn’t a looker. For dessert we had the tiramisu, obviously, which we really liked. While overall the dishes were enjoyable, they suffered from rather mediocre presentation. I can’t help but think that if I’d have had a £15 main from The Pickled Piglet or other venues that it would’ve been presented better. It was reasonably busy on a Friday evening when we went but I do wonder whether an update to something a bit more modern would make it busier – both in terms of the interior and the food presentation. We will go back because we enjoyed the evening, but it feels like one of those places not quite living up to its potential. This entry was posted in Area: Harborne, Cuisine: Italian, Price: Average, Venue type: Restaurant and tagged Birmingham Restaurant, birmingham restaurant review, birmingham review, eating out in birmingham, Out In Birmingham, out in brum, OutInBrum, restaurant review, where to eat in birmingham, Where To Go In Birmingham, where to go out in birmingham. Bookmark the permalink. Sounds very much like Gavino’s in Wylde Green. Old fashioned, but quirky nice? !